Canadian-Warren A. & T. Co. The popularity and increased demand for SAGER axes manufactured in Warren, Pennsylvania by the Warren Axe & Tool Co. led to the company building a manufacturing facility in St. Catharines, Ontario in 1912. By 1913 the operation was fully functional. The Canadian company was called the Canadian-Warren Axe & Tool Company, Limited. By that time the general manager and treasurer of the Warren Axe & Tool Co. located in Warren, Pennsylvania, was a man named Herbert P. Stone. Stone apparently became president of the Warren Axe & Tool Co. and was then in a position to determine how the company was being run. He was instrumental in acquiring the Ridgway Axe Co. of Ridgway, Pennsylvania in 1912. The equipment from that manufactory was relocated to St. Catharines, Ontario where a new axe and tool manufactory was being constructed. That manufactory belonged to the Canadian-Warren Axe & Tool Co., Ltd. and Herbert P. Stone was also the president of the Canadian operation. The Canadian-Warren Axe & Tool Co., Ltd. was legally independent of the American firm. In 1913 the Canadian operation expanded to include the manufacture of other logging tools. This was accomplished by merging with the Canadian Logging Tool Company, reputed to have been the largest producer of such tools in Canada. The Canadian Logging Tool Company was by then renowned for its product line called the "SOO" brand or “SOO-LINE”. The company name remained the Canadian-Warren Axe & Tool Company, Ltd. but the product line became quite similar to the axes and logging tools manufactured in Warren, Pennsylvania. The Warren Axe & Tool Company had already established itself as manufacturers of logging tools as a result of the Bull Dog Line of logging tools that they offered. The American firm made many brands of axes, the most popular of which were those manufactured under the famous Sager brand. The Canadian-Warren A. & T. Co. also manufactured a line of axes under that name. 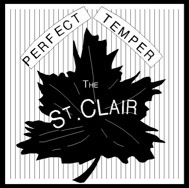 The labels as well as the axes were almost identical to those made in the U. S.
The St. Clair brand is believed to have been used on some Canadian-Warren Axe & Tool Co. axes made and marketed in Canada. Markings observed: Upper: on a chisel. Lower: on a sawyers wedge. Label on left applied to some Canadian-Warren Axe & Tool Co. axes. The label changed somewhat (right facsimile) when Canadian-Warren Axe & Tool Co. merged with the Thomas Pink, Co. These labels are quite similar to the Sager labels applied to the Warren Axe & Tool Co.'s Sager axes made in the U.S. with the two most obvious differences being the company name and the coloring. Apparently the "Special Chemical Process" paper labels were discontinued in 1936 when the company was affected by the Great Depression. Markings on left used on some hatchets and pick-axes. Marking on right used on some mattocks. A subsequent merger in 1928 facilitated considerable additional growth of the company when Canadian-Warren, as the company was commonly referred to, merged with the Thomas Pink Company. The Thomas Pink Company of Pembroke, Ontario, was also a long time established manufacturer of logging tools. They had been established in 1866. The merger helped to increase the overall manufacturing capability of the combined companies. Demand for the products of what became known as the Canadian Warren-Pink Co., Ltd. resulted in the acquisition of two more significant facilities. One was located in Vancouver, British Columbia, and the other in North Devon, New Brunswick. As a result, the parent company became established from coast to coast in Canada. The Depression in 1936 resulted in the closing of the Pembroke facility but the Canadian Warren-Pink Co. Ltd. continued on until 1951 when they were purchased by ETF, Ltd. (Engineering Tools & Forgings, Limited) another major Canadian Corporation. ETF, Ltd. was also located in St. Catharines, Ontario. They continued to manufacture the SAGER brand until 1965, when Canadian Warren Pink was purchased by its largest customer, Dominion Chain Company Limited of Niagara Falls, Ontario. It then operated as Canadian Warren Pink Division, Dominion Chain Company Limited. Their products were primarily forged chain and associated products.